right and a left foot. lients often come into my office believing that they have flaws in their personalities that need to be eliminated. They believe, for example, that they interrupt because they are rude, they don’t go to the gym because they are lazy or they fight with their spouse because they are short tempered. The focus of their efforts to change becomes their rudeness, laziness, or temper. This self-loathing always breaks my heart, because it draws my clients down a psychological blind alley. For although what my clients think of as defects in their nature are important clues about what to change about themselves, it is not at all in the way they originally thought. If you want to change behaviors that you dislike in yourself you must go to the true root cause of the behavior and not a shame-generated lie about why you have been doing what you have been doing. I guarantee that at the root of our unimpressive behaviors lies a gap in our childhood training and not a flaw in our character. Too often our upbringing misdirects us by pointing to our missteps as an indication of our weakness as a person rather than as an indication of something that we don’t know that we don’t know. Each child is born with a unique collection of gifts. When these gifts emerge, and they will very early on because we are designed to lead with our strengths, they do so in raw form. The raw form of a fine human trait is hard to recognize and rarely attractive. With all the finesse of a Skil saw in the hands of a two-year-old, these talents hurl themselves at the environment. Empathy may show up as a tendency to donate valuable family belongings to strangers, stoicism as stubborn withdrawal from the parent/child relationship and exuberance as shrill screams in library-like settings. How the adults in a child’s world handle these emerging gifts will determine, in large part, how competently the child learns to wield their talents. Poor parents focus on the sloppiness of the behaviors, losing sight of the fact that beginners are almost always sloppy. They will use ridicule and punishment to train the child to simply stop using the trait. The empathic child may be labeled as a crybaby. The exuberant kid will be told he is obnoxious. As a result, the child stops practicing the trait, meaning he or she may never get past the sloppy stage. And, in this type of childhood, there is very little likelihood that the balancing trait will be taught. Getting back to my emblematic clients, rather than participate in what I consider to be a psychological amputation, I work with them to figure out what it is that they don’t know that they don’t know. I use a mathematical concept to help them understand the psychology of balance. It is habitual to visualize two opposite things as being mutually exclusive. We think, for example, that to the extent we are shy, we cannot be outgoing; if we are impatient, we won’t be able to remain steadfast; and if we are independent individuals, we are not able to be in a committed relationship. This signifies that we are putting these two conditions on the opposite ends of a continuum. 1)	Low commitment and low independent – this would be a fairly undifferentiated person having neither the ability to be influenced by others nor to be self-directive. 2)	High commitment and low independent – this type of person would be consistently effortful in relationships, but would struggle to make decisions for themselves and could be felt to be clingy or desperate. 3)	High independent and low commitment – this type of person would be consistently so autonomous and rarely accommodating that they could be experienced as somewhere between cool and cruel. 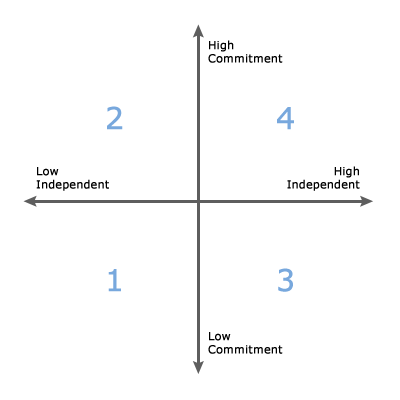 4)	High commitment and high independent – a person represented by this quadrant would be capable of both intimacy and autonomy. Their life would be rich with opportunities to know themselves through time spent with others and time spent alone. The upper right-hand quadrant represents, then, the best of both characteristics and gives us the most versatility. Two opposite characteristics are present in nearly equal strength, both available to use and each insuring that neither gets overused. To use Nietzsche’s metaphor, our two characteristics give truth two legs with which to journey. When we feel the pain of a “flaw”, then, we need to figure out what gift is being overused and then identify the new, balancing talent to be added. Real power follows that strategy, for the result will be a person who has not only maintained their original strength but also has added another. We can only do this if we highlight the strength rather than shrink from it. For instance, rather than blaming ourselves if we make a poor decision, we can be curious about what strength could be driving our decision-making process. We might discover a strength that we didn’t know we had was at work. (“It’s understandable that you jumped to the wrong conclusion. You are a very intuitive person, and you are used to counting on this skill to guide your thinking.”) With the strength identified (powerful intuitive skills) we are in a position to identify the new behavior that needs to be added (powerful deductive skills). The challenge of what to learn next can be phrased in the win/win vocabulary of the orthogonal strategy. (“You need to learn how to deduce so that sometimes you can think things through more deliberately.”) While it’s true that our inductive thinking skills will probably always exceed our deductive thinking skills, by learning to attend to the balance between them, we can often prioritize the skill best suited for the situation early in the process of choosing. We have kept our original skill and added another. The what-to-change protocol, then, goes like this: sidestep shame, be very curious about your “flaw”, uncover the over-used strength and design a balancing one. If you believe you’re too lazy to go to the gym, perhaps it’s because you tend to be a perfectionist and don’t want to go to work out unless you’re already fit. Hold on to the perfectionism and add the ability to be a practitioner – a person who honors the imperfect process of learning something new. If you believe you have a bad temper because you fight with your spouse a lot, think about how useful it is to be assertive. One way to balance assertiveness is to practice temperance by letting your spouse speak his or her mind first, trusting that you can assert later if need be. 1)	Low inclusivity and low competitiveness – this would likely represent a person who interacts very little with others, neither incorporating others in his/her thinking nor testing his/her competence in competition. 2)	High inclusivity and low competitiveness – this type of person would be quite committed to gathering information from others. They might, however, have difficulty implementing the vision that results from their rich collaborative efforts because they lack the incisiveness that competition hones. 3)	High competitiveness and low inclusivity – although perhaps successful, a person in this category will need to win so much that she or he may alienate others and therefore become trapped in a lonely life. 4)	High inclusivity and high competitiveness – a person represented by this quadrant would be capable of attaining competence through both struggle against and cooperation with other powerful folks. They willingly listen to the perspective of others and yet still trust their inner ability to reach their own conclusions about how best to proceed in life. Remember, what always gets us in trouble is a strength that we have come to over-rely on. Don’t throw away that strength. Just rein it in by giving it another strength to compete with, and then you’ll have two giants working to make your life more effective. But how do we get these two giants to work together? What we need is an internal referee who can help us determine which skill to prioritize in a given situation. To that end, the referee must first understand on a deeper level what is valuable about each strength. There is a term in the mathematical world of game theory – “utility function” – that refers to the process of assigning values to certain outcomes, and I think the term works well here. We need to know the utility function of the two competing values in the upper-right-hand quadrant if we are to choose wisely between them. That deeper understanding will help us choose whether, for example, it makes sense at this point in the meeting to interrupt and move to action or to listen to further deliberation. To compare the utility function of the two options from our example – competitiveness is an effective value for acquiring and sharpening skills, increasing efficiency, enhancing opportunities, creating new options, handling emergencies, etc. and inclusivity is potent when we want to gather data, diversify our thinking, optimize cooperation, engender brainstorming, build community, and so on. We need to know which outcome we are seeking in order to know which value to prioritize. If this is an emergency meeting, we may want to stay with a more competitive value. If we are seeking new ideas, inclusivity. Our referee needs to study both strengths, be alert to the utility function of each, feel no shame about using either and then make a choice in the moment. If it turns out to not be the best choice, our other strength is standing by ready to take the stage. If you find it difficult to learn the skill that will balance out one of your strengths, find someone you admire who has the skill and copy them. This is called “fixed-role therapy” and it is extremely effective. If your friend Martin is the consummate listener, ask yourself What Would Martin Do when you want to evoke that skill set. (Aside: I get a kick out of the acronym W.A.I.T. – Why Am I Talking? – so it makes me laugh and relax when I want to remind myself not to interrupt.) Most of us should have quite a number of these equilibrium-inducing consultants tucked away in our minds who we can imitate as we learn new ways of being. The human arm presents us with a reminder that balance is paramount, for, without the little tricep, the large bicep is useless. So if you want to wield a powerful psychological arm, keep working that dominant bicep but remember to attend to the small but indispensable tricep as well. By nature I’m an exuberant person. If I could go through my daily activities in a cheerleading uniform with iridescent pompoms, raised fists and unabashed enthusiasm, I’d be one happy fella. I love to see life as aspirational, pungent and interactive. I want the crowd involved in the game. My happiest moments are when everyone contributes, all are invested and each is rewarded. A bit utopian, I know, but I am also thrilled when even some aspects of these dreams come true. By upbringing, however, I’m mean-spirited. I go through my daily activities as would a ferret, weasely and vicious. I firmly believe that nothing will go right and that every change will bring new irritants to fight. I spend too much energy trying to deter others from entering my territory, fearing that they cannot be trusted not to step on me. I believe I have no direct power, so I sneak around behind the scenes and interfere where I can. Given the chance, I bite. Trapped, I lie. As you can imagine, having a peppy little cheerleader and a pissed off ferret cohabitating one’s mind is taxing. The temptation, of course, is to go on a ferret hunt to eliminate the rodent. It would be unwise, it turns out, to follow that impulse. The ferret is actually a nascent form of what I need in my brain to balance out the cheerleader. My childhood didn’t train me to be a ferret, per se. It just dropped me off halfway through the training to become a tiger. What I need to balance out my dominant tendency to constantly give myself away to the world through my enthusiastic participation is the ability to set limits with strength and dignity. I need the tiger to protect the cheerleader. My self-construction project here, to pick up where my parents left off, requires me to finish turning the ferret into a tiger.